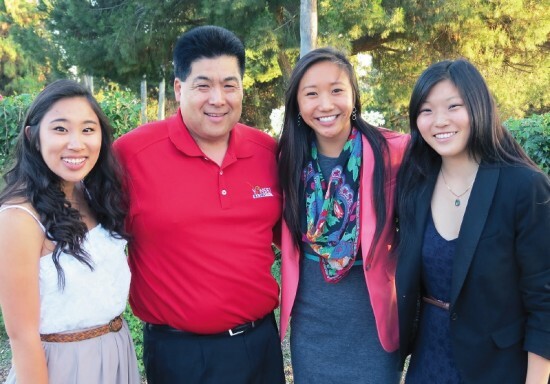 Yonsei Basketball Association President Mark Nakakihara with scholarship winners (from left) Kelli Tani, Amy Wong and Kristen Koyanagi. WHITTIER — The 2013 Yonsei Basketball Association scholarship recipients were announced at the annual Yonsei Golf Tournament, which took place on June 24 at Candlewood Country Club in Whittier. The Sue Kamiyama Scholarship was awarded to Kelli Tani, a graduate of Torrance High School who will be attending UCLA to pursue a degree in economics. Yonsei Scholarships were also awarded to Amy Wong and Kristen Koyanagi. Wong is a graduate of Troy High School and will be attending St. Louis College of Pharmacy. Koyanagi is a graduate of Palos Verdes Peninsula High School and will be attending Washington University in St. Louis, pursuing a degree in business. The Yonsei Basketball Association in a non-profit organization providing a cultural exchange program for eighth-grade youths in the Southern California area. The Yonsei Scholarship recipients exemplified the Yonsei philosophy of academic excellence and community service.